Love John Kenneth Muir’s examination of one of the most controversial films of the 00s. I love it, Roger Ebert too, and my bride hate, hate, hates it. 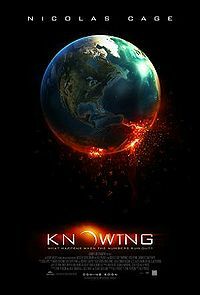 Knowing, the controversial and apocalyptic 2009 film directed by Alex Proyas (The Crow , Dark City , lands on The Big Issue of Human Existence during an early classroom scene set at M.I.T. Astrophysicist, professor, and widower John Koestler (Nicolas Cage) debates with his students the competing values of “Determinism” and “Free Will” (or The “Random.”) The mechanisms of the Universe, he is certain, operate by one of these governing principles. If Creation is of a Determinist nature, everything occurs for a reason. There is order in the universe…purpose. I also loved this. My husband was indifferent at best and there is lots wrong with it but I can’t resist watching it every time it comes on TV. I had no idea what this was about nor do I know it has some spiritual aspect, I think I avoided it as it’s got Nic Cage in his cash-grab mode, ahah. I might give it a shot if you love it though Michael. I’m gonna be honesty. I hated this film. Thanks for joining in on this. My wife and I both loved this films and we are also big Cage fans. I guess it’s all a love it or hate it sort of thing. I gave Knowing 5 star review on Amazon a few years ago and it started a onslaught of comments both in my favor and against me and into the who religious philosophical nature of the film. I’ve continued to get comments on that review to fairly recently. Nicely done. An odd little movie this, but the plane crash scene is something else. That was a spectacular scene. Thanks, Chris. This has got me thinking that I should give this film another go. I absolutely despised it first time round. John does make a good case for it. After you watch the film again, let me know if it made a difference. Thanks, Mark.